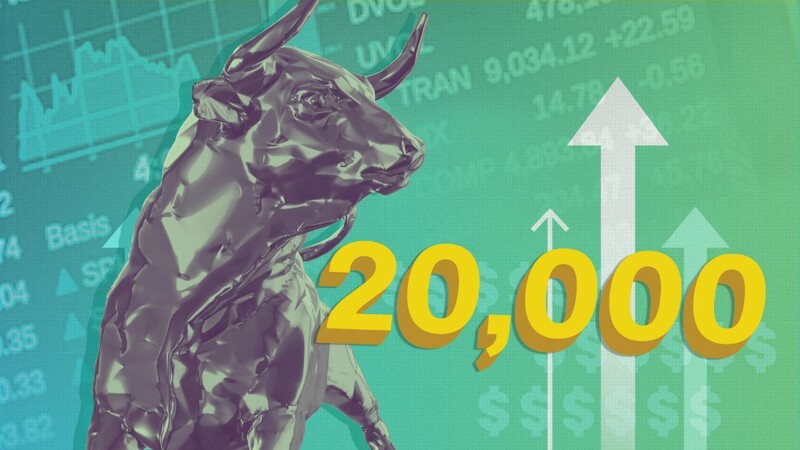 Dow 20,000 is finally here. After weeks of close calls, the Dow made history on Wednesday by blowing past that key level for the first time ever. The Dow climbed 156 points to 20,069 and was joined in record territory by the S&P 500 and Nasdaq. 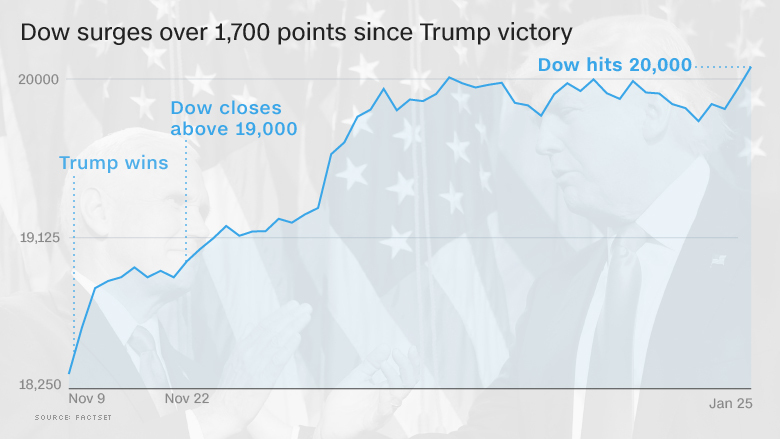 The historic milestone leaves the Dow up more than 1,700 points since President Donald Trump's victory in November. The achievement is evidence of how optimistic investors have become about the prospects for the U.S. economy. "The stock market has given him this extraordinary vote of approval. Happy days are here again," said Ed Yardeni, president of Yardeni Research. Wall Street is clearly betting that Trump's plans to slash taxes, ramp up infrastructure spending and cut regulation will make the American economy grow faster. If that happens, without any disruptions to global trade, it could propel corporate profits, the lifeblood of stock prices. But the jump in stocks is also a reflection of the solid economy Trump inherited from former President Obama. The U.S. has added jobs for a record 75 straight months and the unemployment rate is sitting near a 10-year low. 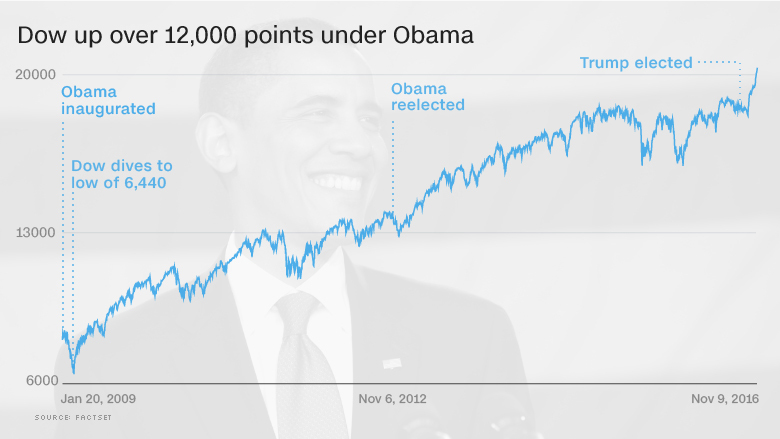 The Dow 20,000 milestone also shows how much has changed in the U.S. economy over the past eight years. The index crashed to a low of 6,440 in March 2009 as Wall Street feared a complete collapse of the American financial system. The astounding 13,500-point rise since then has been fueled by a consistent, albeit imperfect, economic recovery combined with the U.S. central bank's massive stimulus program and near-0% interest rates. While the economic rebound from the Great Recession has been slower than many hoped, the unemployment rate is now at the lowest level since 2007 and corporate profits have climbed to record highs. "The economy has come a long way in eight years. Overall, it's a healthier economy and does justify a much higher stock market than eight years ago," said David Kelly, chief global strategist at JPMorgan Funds. Few expected the Dow to rise so much, especially after a Trump victory. In fact, many feared a market crash if Trump upset Hillary Clinton. Instead, Wall Street embarked on a very impressive post-election rally that carried the Dow above both the 19,000 and 20,000 levels. CNNMoney's Fear & Greed Index is flashing "greed," a vast improvement from "extreme fear" mere days before the election. The VIX (VIX), a gauge of volatility in the markets, has dropped to the lowest level since July 2014. But the Trump rally cooled off in recent months and Wall Street hit a bit of a psychological roadblock leading up to the 20,000 level. On January 6, the Dow got incredibly close, rising to 19,999.63 before backing off. 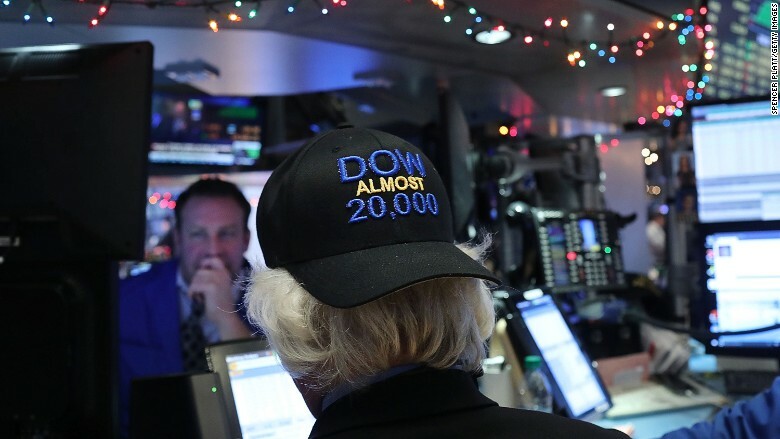 Traders on Wall Street had fun with it, with some creating hats that said: "Dow Almost 20,000." One reason for the pause: investors want more details on the timing and effectiveness of the stimulus plans rolled out by the new administration. "We've scaled this peak. We're going to enjoy this view for a while and hit the pause button," said Joe Quinlan, chief market strategist at U.S. Trust. Bank stocks have been among the biggest winners during the post-election party on Wall Street. JPMorgan Chase (JPM) and Morgan Stanley (MS) have soared more than 20%, while Goldman Sachs (GS) is up nearly 30%, as investors bet on higher interest rates and less regulation under Trump. But JPMorgan's Kelly worries that "markets seem to be pricing in the positives, and not worrying too much about the negatives" such as a potential trade war or fiscal stimulus that overheats the economy. Quinlan agrees that trade remains a serious risk given Trump's anti-trade rhetoric during the campaign. Already, Trump has scrapped the TPP trade deal and plans to swiftly start renegotiating NAFTA. "We need open borders, open trade and open flow of capital. If we start going down this deglobalization road, this market is going to lose its euphoric underpins pretty quickly," Quinlan said. Yardeni said the jury is still out on whether the enthusiasm on Wall Street is overdone. "Is the market irrationally exuberant or will Trump prevail in a way that's bullish for the economy?" he asked. "The bottom line on Trump is: love him or hate him, you don't want to bet against him."